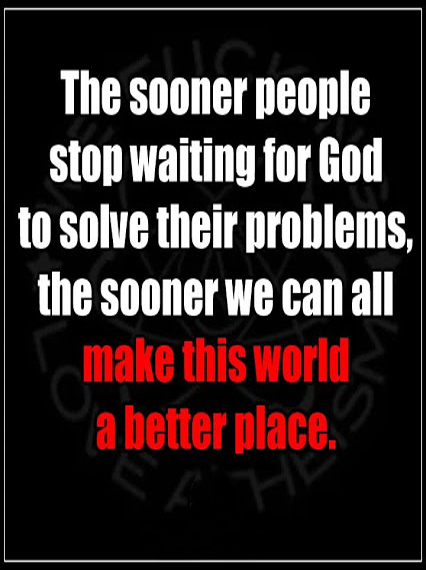 Have you met anyone sitting around, drinking margaritas and watching awful TV shows because they have nothing better to do than wait for God to fix stuff? Me neither. I suspect this graphic, found in an atheist Internet community, is making an offhand reference to prayer. If I’ve learned anything from my interactions with atheist people, it’s that almost all of them believe prayer is an idiotic waste of time. If we had stopped and waited for God to fix the problem, would organized crime have come to North America? I’m referring to prohibition in the United States during the 1920s. Human actions to reduce alcoholism not only failed, they created negative consequences that are still being felt almost 100 years later. People brought rabbits to Australia and New Zealand for food. What followed was an explosive growth in the rabbit population to the point where they are now major pests in these countries. Still in Australia, people introduced cane toads to control canefield pests. Bad idea. Canefield pests are still there and cane toads are now a major problem in their own right. How often have people, through their governments, introduced rent controls to prevent sky-high rent increases? How often has that resulted in major shortages of rental units – making it nearly impossible for low-income people to find a place to live? So it’s clear that ignoring God and doing things on our own often makes this world a WORSE place. Sometimes, I’m guilty of this very mistake. Because I’m part of a culture that lives as if God and Jesus Christ — whom serious Christians believe is His divine son — don’t exist, I get sucked into that same thinking. I forget to pray about things. I forget to wait on God — even though the Bible tells me “The Lord is good to those who wait for him. He is good to those who look for him” (that’s from a section called ‘Lamentations’). In case I didn’t get it the first time, another Bible section called ‘Psalms’ says “Be strong and brave and wait for the Lord’s help”. Patience is a gift I’m continually learning as a follower of Jesus. There are other gifts, too: seeing beyond my ego to what’s truly important; understanding that this world is NOT how God wants it to be; and allowing Jesus to work in my life to make me more like the person He knows I can be. Do these gifts sound appealing? Yes or no, post your thoughts below and let’s have a conversation. Through writing my novels and my devotional blogs, God has taught me so much about prayer and waiting upon Him. When we forge ahead, disregarding what His will might be, we inevitably find ourselves in predicaments we cannot control because we didn’t turn to Him in the first place. For me, too, Frank, patience is a gift I am continually learning and refining, and I so long for Jesus to continue to work through me for the glory of the kingdom. Or are you suggesting that especially Christians have (or should have) a relaxed attitude when it comes to drugs? Are you implying that we should give up prohibition of hard drugs because God will take care of Crystal Meth? Concerning the next two examples: I agree that these were ignorant people who didn’t know enough about ecology and evolution. Today we understand these mechanisms far better. Concerning your last example: This is economics 101. – Would it mean having a lenient policy on drugs or the contrary as Christians thought at the time of the prohibition or today concerning other drugs? – Would it mean trying to understand the wonders of nature and natural processes as they were created (modern catholics, i.e. the majority of Christians) or denying certain parts of scientific knowledge like evolution (only certain fundamental, but very faithful, Christian denominations, i.e. the minority of Christians)? Shall “He that doeth the will of God abideth for ever.” (1 John 2:17)… and who knows what “will will of God” really, really is…?!? 1. I’m not implying Christians should have a relaxed attitude about drugs. 2. I’m not in favour of denying certain part of scientific knowledge. I’m also not in favour of blindly accepting all that science puts forward as fact. Wisdom and discernment are needed here. 2. One way to know the will of God is to read the Bible, pray about what you’ve read, talk to people about the things you don’t understand (and there will be lots, trust me) and read commentaries about the Bible. Yes, this takes some effort. But I believe it’s worth it.